It wasn't the biggest city on the list. Or the one with the most tech cred. But Columbus, Ohio, just won $50 million for its plan to create the transit system of the future. On Thursday, the Department of Transportation announced that Columbus was the winner of its Smart Cities Challenge. It beat out the six other finalists: San Francisco, Austin, Pittsburgh, Kansas City, Mo., and Portland, Oregon. "We're on the cusp of a transportation revolution," said Anthony Foxx, the secretary of the Department of Transportation. "Columbus put forward an impressive holistic vision for how technology can help all its residents." The contest was launched to help a city transition over to a "smart" transportation system that uses technology like self-driving cars and connected vehicles. The city will receive up to $40 million from the DoT, and an additional $10 million from Microsoft cofounder Paul Allen's Vulcan Inc. Local businesses in Ohio have pledged another $90 million in funding for the city. Other partners will also chip in money and technology to help the city, including Amazon (AMZN), Alphabet (GOOGL) and MobileEye. "We have a real opportunity to change the lives of the people in Columbus," said Mayor Andrew Ginther. "This will make a difference in our ability to help our residents with ladders of mobility who need them most." Columbus's plan emphasized electric and autonomous transit, and focused on improvements that would have a positive impact on lower-income neighborhoods. Columbus envisions creating corridors for autonomous vehicles, turning the city's fleet to electric vehicles and equipping thousands of buses, taxis and cars with vehicle-to-vehicle communication. 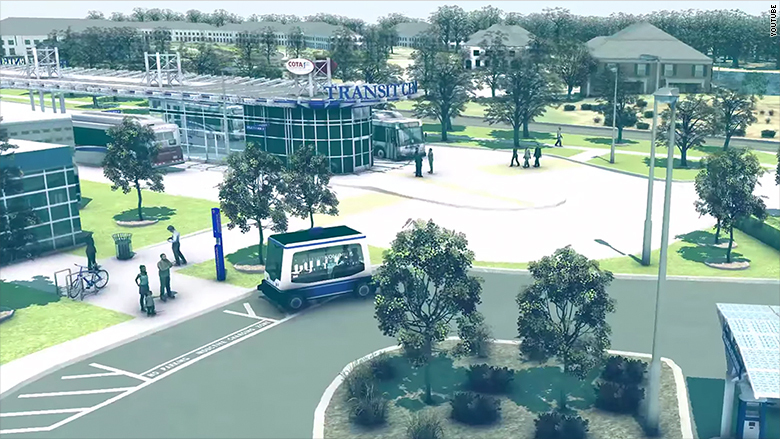 Its proposal includes three electric self-driving shuttles to link bus service to a retail district, which would better connect citizens to jobs. Columbus sees benefits that will extend far beyond transportation. The city said it will improve health care in Linden, a neighborhood with an infant mortality rate that is four times the national average by providing ride services to those who need care the most. To handle commercial traffic, Columbus would collect data to and use it to create tools that help vehicles like trucks operate efficiently. Other apps would be aimed at helping tourists get around or residents better access services and navigate the modern transportation network. "I look forward to working with local leaders and community members to realize the vision of a first-of-its-kind transportation service that increases access to jobs, links neighborhoods, and improves real-time information in a sustainable, safe way," said Ohio senator Sherrod Brown in a statement. The DoT and its partners have said they will collaborate with all the finalist cities to help them with their plans.